In 1511, his uncle died in a shipwreck near Naxos. 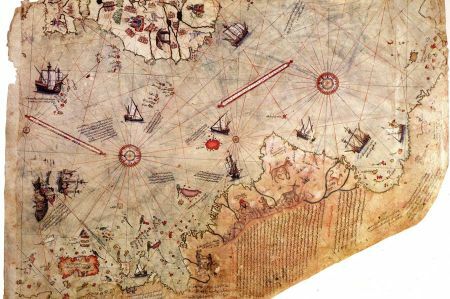 As a result, Piri Reis moved to Gelibolu and began to write his seafaring book on the Mediterranean "Kitab -i Bahriye". He started with the creation of his nautical chart at this time, for which he also used foreign maps, the history even says that one had been a map of Alexander the Great. The conversations with many sailors on the way had led to information that nobody had gathered before him. His language skills in Greek, Italian, Portuguese and Spanish were a great help as he was able to talk directly to the sailors. From the year 1516 Piri Reis was captain of the Ottoman fleet in the Mediterranean and in the waters around the Arabian Peninsula. In 1517 he was the first to explain Sultan Selim I. his first world map. 1516/17 he participated in the campaign against Egypt and then completed his Kitab -i Bahriye in 1521. In 1522 he participated in the successful siege of the island of Rhodes. In later years he was a Turkish governor in Egypt, wrote poetry and wrote more on his sailing instructions in lyrical form. In 1524 he was the captain of the ship, which brought the Grand Vizier Ibrahim Pasha to Egypt. After he had revised the Kitab -i Bahriye on the advice of the Grand Vizier, he could submit his material to the Sultan Suleiman I in 1525. In 1528 he gave the sultan his second world map. 1547 Piri Reis was appointed Commander in Chief of the Ottoman fleet in the Indian Ocean (Hind Kapudan -i Derya) and Admiral of the fleet in Egypt (Misir Kapudan - i Derya) with base in Sues. On February 26, 1548, he succeeded in recapturing the city of Aden occupied by the Portuguese. In 1552 he took the since 1507 by Portugal occupied important base Muscat. Shortly after, he conquered the island of Kish. In 1552/53, he besieged the island of Hormuz with 31 ships and more than 800 soldiers. The island's inhabitants offered him great treasures, which he accepted and saved the siege of the island. On his way back to Suez, he was informed that a powerful Portuguese fleet was blocking entry into the Persian Gulf. Piri Reis then had the captured treasures reloaded on three ships and left the bulk of his fleet (28 ships) in safe Al-Basra. With the three ships he tried the breakthrough by the Portuguese blockade, which succeeded in losing a ship. However, on his arrival in Egypt, his political adversary to the post of governor told to the Sultan there that Piri Reis had arrived with only two ships of his fleet (originally 31 ships). He also mentioned neither the salvation of the fleet in Al-Basra, nor the treasures on the two ships. Sultan Suleiman furiously ordered the death sentence for Piri Reis, who was publicly beheaded in 1554 at the age of 84. With him one of the outstanding cartographers of his time died, who, however, had never seen most of the countries he had drawn. His sailing instructions for the Mediterranean as well as for the other seas he described were groundbreaking.